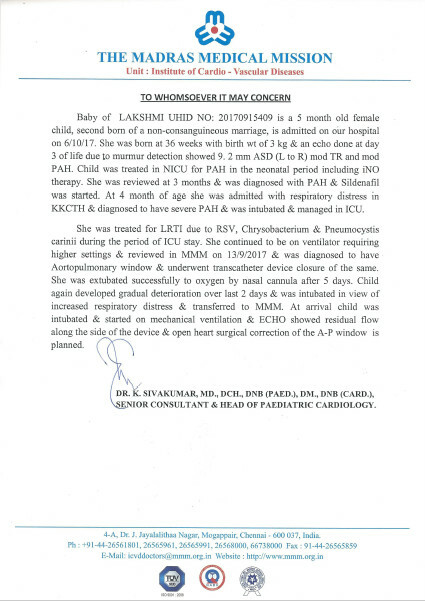 Update: Baby of Lakshmi has been shifted to Madras Medical Mission to undergo an urgent open heart surgery. The family has spent close to 6.5 lakhs for the treatment at KK Childs Trust Hospital. 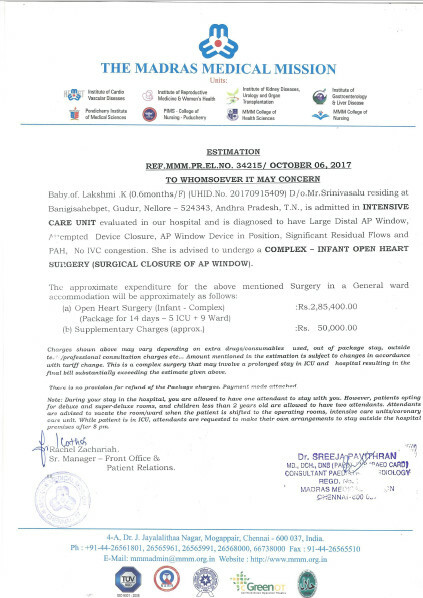 The open heart surgery is estimated to cost 3.2 lakhs. We are increasing the target amount to help the family raise funds for the treatment. The funds raised so far have been utilised to close bills at KK Childs Trust Hospital. B/O Lakshmi is a five-month-old baby girl who was born on 6th April 2017. The baby is suffering from severe RSV and chrysobacterium pneumonia. She had severe pulmonary hypertension. Echocardiography showed aorto-pulmonary window which was closed with a device. Her father Srinivasulu is a private school teacher in Nellore earning 13000 per month and mother Lakshmi is a home-maker. She has an elder brother who is 7 years old. Baby of Lakshmi needs to be on ventilator support for 10-15 days to lead a healthy life. I am very thankful to you for extending your support to B/O Lakshmi . The operation was successful and the baby is ready for discharge. The final bill settling is happening . Thanks a lot for yet another great help in the moment of crisis for the family members. 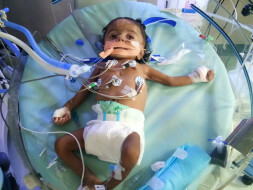 Baby of Lakshmi has been shifted to Madras Medical Mission to undergo an urgent open heart surgery. 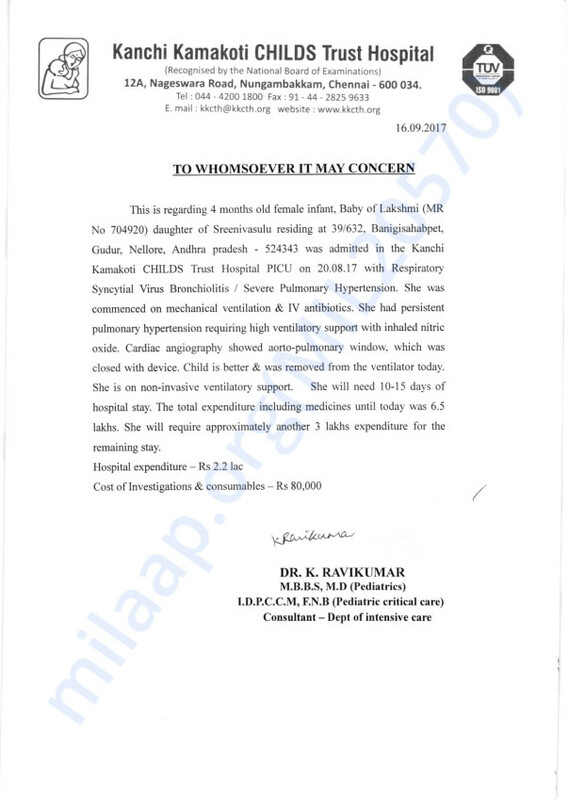 The family has spent close to 6.5 lakhs for the treatment at KK Childs Trust Hospital. 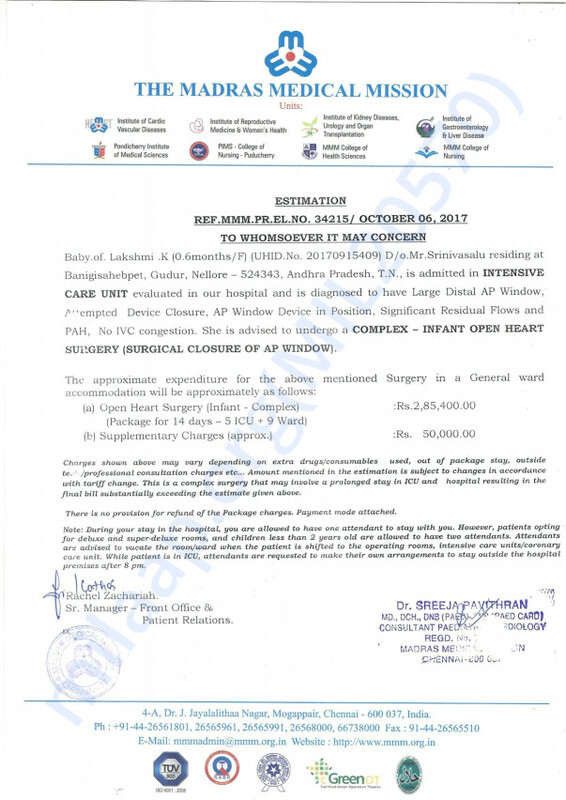 The open heart surgery is estimated to cost 3.2 lakhs. We are increasing the target amount to help the family raise funds for the treatment. The funds raised so far have been utilised to close bills at KK Childs Trust Hospital. We have some good news to share with you today. 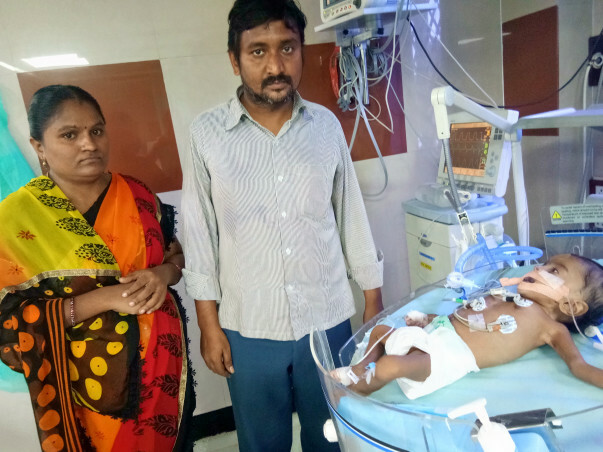 Baby of Lakshmi was diagnosed with respiratory issues and was being administered treatment for the same in Kanchi Kamakoti Childs Trust Hospital. She was in the PICU for a month and she required ventilator support. On further diagnosis they doctors found that she had issues with her heart and the doctors have treated her for the same. Her health stabilized gradually and she is going to be discharged. Thank you for all the love and support you have shown her. Please do pray for her health. Kanchi Kamakoti Childs Trust Hospital.